I was in communication with a fellow Loch Ness Monster enthusiast recently about an aspect of Loch Ness research that barely gets a mention in the general discussion and that is the legacy of past researchers. We can list the honoured people who dedicated years if not decades in the pursuit of this mystery who are no longer with us. I think primarily of Rupert T. Gould, Constance Whyte, Tim Dinsdale and F. W. Holiday and others. But there will be the lesser known people who gathered material on Loch Ness but never went to print with them. We also have the groups such as the Loch Ness Investigation Bureau which has long disbanded. Yes, we have the books, newspaper articles and magazine features but what about their private collection of material? We can be sure that not everything of interest made it into their books and we can be sure that items continued to be gathered after their last publications and before their death or disbanding. I have queried various national library catalogues with no indication that any works were deposited with these publicly accessible organisations. Admittedly, some collections will still be held by the family of the deceased. Some will not be considered significant enough to be put in the vaults of these places while some were sadly destroyed or lost when the estate of the deceased was distributed. I have hopes that the works of Rupert Gould on the Loch Ness Monster will be hidden amongst his other notable horological items. I suspect these may be in the British Library or some other archive in the London area. I am optimistic that Tim Dinsdale's works are still with his family and well preserved. Constance Whyte's works are a mystery as they seem to have been bequeathed to someone but have been subsequently lost. This needs clarification. F. W. Holiday's works are a mystery too. He died unmarried and without children as far as I know. I have a theory as to where they are now but again this needs clarification. But the biggest question mark is the whereabouts and accessibility of the materials gathered between 1962 and 1972 by the Loch Ness Investigation Bureau. I suspect some material may be held at the Loch Ness Centre in Drumnadrochit but they need to confirm that. A lot of material may have been distributed to individuals on their closure. The point I want to make is that the LNIB materials ought to be made publicly accessible to all researchers. "To study Loch Ness to identify the creature known as the Loch Ness Monster or determine the causes of reports of it." Then who are the successors of the LNIB and on whom does the mantle now fall? Certainly not any one individual but I would suggest anyone with a serious interest in the subject - be they on the "skeptics" or "believers" side. Meanwhile, access to private individual collections are a matter for the new owners to consider. Do they let these items of potential importance lie in a dark corner of an attic until they decay or are thrown away? Must a new generation of researchers have this information lost forever or have to go through the exertions of re-discovering old knowledge again? Finally, I am not addressing the matter of how these materials are made accessible. It is unlikely that much of these items are digitised or ready for email and the web. It may be that one has to physically travel to see such material. It may be a matter of someone volunteering of their time to scan and collate documents. The point of this posting is the matter of being granted access in the first place. The legacy of the Loch Ness mystery should be made available to those who can take it further. If anyone has such a collection, I ask them to contact me about what they have! Constance Whyte: Held at one time by Nicholas Witchell (rumours of this being lost need to be confirmed/denied by Nicholas himself). 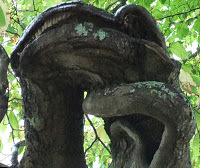 A reader sent me a link to a photograph he took at Fort Augustus of a Nessie-like tree branch. Why this did not win the Oscar for Best Film in 1934 I'll never know. Actually, I do know, it's a pretty poor film technically. 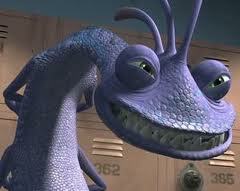 But in terms of Nessie films, it is a classic. Cashing in on the Loch Ness Monster craze that started the year before, it began a line of Nessie films which persists to this day and still draw in cinema goers. I got this film on DVD some years back and enjoyed it purely from a Nessie-phile point of view. The monster at the end seems to very much take its cue from the theories of Rupert T. Gould which is probably no surprise. The London Zoological Society are credited as advisors. As arch-Nessie skeptics, one can only wonder what they said to the film producers. Anyway, I just found the whole film available on YouTube, so enjoy this piece of Loch Ness Lore and look out for David Lean as the film editor who went on to greater fame with "Lawrence of Arabia". UPDATE: The link has been removed from YouTube, oh well. It may turn up again! Following on from our tale of the monk and the monster, another man of the cloth is behind our latest classic sighting. This sighting is not one that can be found in the standard Nessie text books but it nevertheless has all the qualities that constitute a classic sighting as we shall relate. In fact, this story may well have remained in a dark corner if it was not for the labours of Paul Cropper. Paul, though he believes there is something unexplained in Loch Ness is primarily a Yowie man. For those who wonder what a Yowie is, go to Paul's website at this link. The following transcript and photographs are under Paul's copyright. Paul had heard that a man by the name of Gordon Powell in his native Australia had seen Nessie and made arrangements in 2001 to interview him about the sighting. By then, Rev Powell was long retired but the memory of the event was still there for Paul to record. The Reverend Doctor Gordon Powell himself was born in 1911 and was ordained into the ministry in 1938. It was a scholarship to Glasgow University in 1935 that brought him to Scotland. He went on to a successful ministry in Sydney as well as a popular radio ministry. He died in 2005 aged 94. I was a student at Glasgow University at the time and I was with two other students. We were on a camping trip around Scotland and we’d camped beside Urquhart Castle. And one of the significant things I found in investigating the whole thing was that the local people have a superstition that Nessie brings bad luck and the only way to avoid it is to not talk about seeing it. I took my wife back in 1960 and hoped that she would see it as I did. And I said to the young man in the Drumnadrochit Hotel, I’ve seen the Loch Ness monster and I was going on to explain I wanted my wife to see it. And he shook, he really trembled all over, he said “don’t talk about it, don’t talk about it”. And he refused to talk about it. Well, by the extraordinary coincidence there had been a death in a family that morning, we were all theological students and we’d gone to church, and I’d say the service lasted from 11:00am ‘til after 3:00pm. It was a six monthly communion service and half in Gaelic and half in English. And anyway, we met Mrs MacDonald who was distressed because her brother-in-law had died and she couldn’t get to the house. And the other two chaps offered to drive her there. And they left me alone. I was writing a letter home and I was sitting on the bank and it was a perfect day for the viewing. The paragraph concerning his wife is a paranthetic about his second visit to Loch Ness in 1960 but I can concur with his statement about local fear of the monster having researched the Water Horse aspects of the creature for my book. Then the Loch Ness Monster appeared to unsettle his quiet solitude. The sun was behind me and the water was so calm that in Urquhart Bay it was like glass. And I happened to look up just in time to see a disturbance in this glassy area, and then a head came up like a calf. From that distance I couldn’t see any horns or ears, it was very smooth, the head, and a long neck. And then it looked just the one way and then looked straight towards me, and then it looked at what was ahead. And my theory is it spotted a school of salmon. It was the salmon season of course, the middle of summer, and it chased something anyway, whether it was salmon or something else, at tremendous speed. And at least three humps came up, possibly a fourth, and there was a lot of spray. It was very much alive. It was very large. It swam very quickly, it bucketed along the surface very quickly and after … well I grabbed my camera and I took a picture after it had gone I suppose perhaps two or three hundred yards, and then it swam on for a similar distance and then dived. I wrote in the letter a few minutes later that it looked like an enormous eel to me. But then I thought about all the spray that it sent up and I thought well an eel wouldn’t send up a lot of spray, something with flippers might do it. And well that was as I saw it then. A week or two later or some … no, it was on the second trip I was in London and I went into the Victoria and Albert Museum and I didn’t know what I was going to see. But I went into one room and I gasped “..there’s Nessie!” It was a skeleton of a plesiosaurus and it had a long neck, a small head, a long tail and a big body with four flippers. And there it was in skeleton form. I don’t know if it was a plesiosaurus but it … some people say it could be. I suddenly thought well this is a … be surviving for about 50 million years. 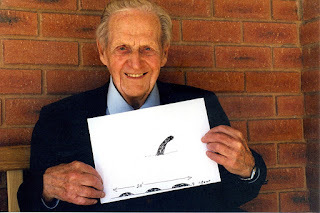 Helpfully, Gordon drew a picture for Paul of what he had seen which is shown below with the man himself. The form of the beast seen is very much the classic sighting - long neck, small head and a number of humps following. Paul asked for more details concerning the sighting. Powell said the creature emerged beyond the centre of the bay at over 500 yards and moved nearer until at the point of submerging for good, it was only 200 yards away. The head and neck were visible mainly at 300 to 400 yards. The neck was estimated as six feet out of the water. The duration of the sighting was put conservatively at between 30 and 60 seconds. Gordon also mentioned that he took a photograph of the sighting. Did he capture the head, neck and three humps on film? The answer is "No" in the sense that no such detail is visible on the print but it is reproduced here for completeness. 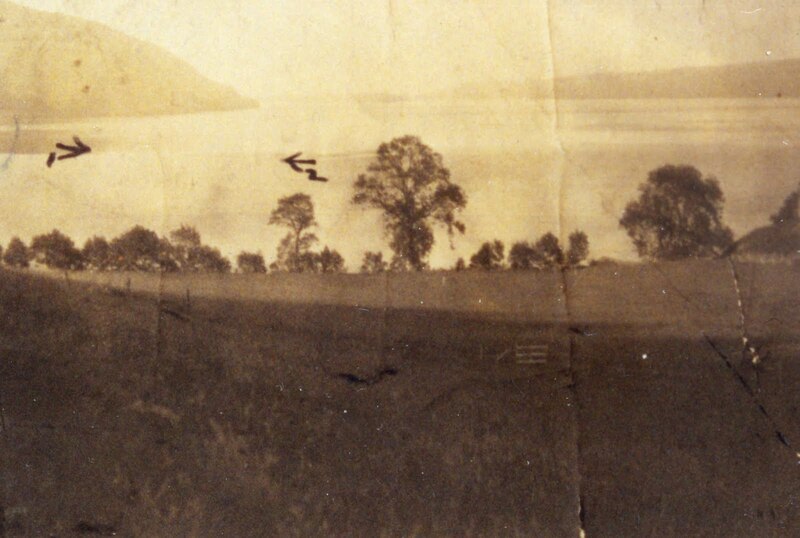 The arrow marked "1" is where the creature first appeared and "2" is where it was at the point of the picture being taken. Mr. Powell supplied a better picture with further comments attached which we reproduce below. So ends the story but I add my own research and thoughts at this point. Firstly, a trawl of newspaper archives revealed that this sighting had featured in a 1977 article on churchmen and monsters. The article is from the 7th September edition of the Sydney Morning Herald. The text of his sighting is below which pretty much agrees with what he said to Paul Cropper 24 years later. The water was calm like a mirror. Suddenly there was a bulge in the bay and this thing shot up; its neck was about six feet long and a foot thick. Its head was smooth, without horns, and reminded me of a calf. The body was dark brown or black. The creature looked around, dived, and swam at great speed towards the castle. There were three or four humps. I grabbed my camera and took a picture which showed the wake. My reactions had been slow because of the shock. He makes the depths churn like a boiling caldron and stirs up the sea like a pot of ointment. A fitting Biblical allusion to the power the Loch Ness Monster is said to exert on its surrounding waters. Next day in the newspaper, three other people reported seeing what I saw at the same time in the same place. Naturally, if one witness corroborates another's story then that lends weight to the overall testimony. Mr. Powell does not state what newspaper he read so some guesswork is involved here. I went to the Inverness Courier microfilm archives at the National Library of Scotland and examined the issues beyond the 21st June 1936. One of the best views of the "Monster" was obtained on Sunday afternoon by Miss H. MacFie, 5 Porterfield Bank, Inverness, and Mr. J. Fraser, Firthview, Auldcastle Road, Inverness. They were cycling along the east side of the loch in the direction of Foyers, when suddenly they saw a large object rise about the middle of the loch and travel in the direction of Urquhart Castle. Although a considerable distance away, both were certain it was the "Monster", for it created a great disturbance in the water by splashing. They watched its movements for fully four minutes before it ultimately stopped, and seemed gradually to sink below the surface. It would seem that Mr. Powell's sighting took off from where Mr. Fraser's sighting finished as his creature headed off towards Urquhart Bay. The time of this sighting is merely stated as the afternoon which could place it anywhere between noon and 6pm (depending on how you define "afternoon"). 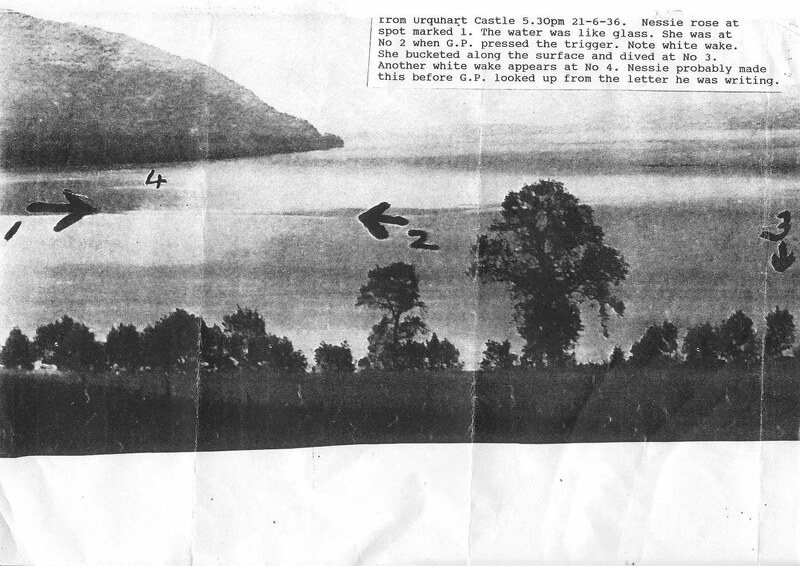 So it is possible the two groups of witnesses were witnessing two parts of one overall Nessie journey. An effort to resolve this matter further could be made by examining other Highland newspapers for that week since the Courier was not the only paper which took an interest in the Loch Ness Monster. I will update this posting if I find anything of interest. But we are happy to add this "new" sighting of the Loch Ness Monster which lay hidden from the standard Nessie text books and web sites for years and again we thank Paul Cropper for his diligence in bringing it to our attention.